KEEP CALM AND CARRY ON: How I Found Out // Telling Our Family! How I Found Out // Telling Our Family! I'm usually pretty sharp and on my game, so I like to think. Billy likes to joke with me that he can't get anything by me because I'm already one step ahead of him. Well, those days are long gone (actually, now I'm back to normal..phew). But no lie, one of the first signs that got me to thinking that I might be pregnant was how clumsy and darn forgetful I was the first few weeks. For instance, this one time I paid for my gas and left before even pumping it, and didn't realize until two hours later. Or how about the time (meaning multiple times) I've tried doing a task at work and somehow end up in the refrigerator staring blank inside saying to myself, "what was I doing again?! I did NOT mean to end up here!" Pregnancy brain is a real thing. Anyways, I always had this thought in my head that it would take me forever to get pregnant. I don't know if it was because I was on birth control for so long (I've been off it though for over a year now), and I figured that it would mess me up somehow or what, but I was convinced. Billy, on the other hand, was convinced it would take one time. Wrong (both of us). I'm not going to get into this too much but my entire life I had regular, right on time, easy periods. Then, of course, when we decided to start trying, I started having irregular periods and terrible mid-cycle bleeding. It was also during these months that people were asking me more often about when we were going to have kids...it was disappointing and made me sad. I got really down on myself and became way more sensitive about asking others that very same question because the truth is (as much as people like to say otherwise) you just never know if a couple has been trying, and is having problems. You won't hear me ask any of my friends this question due to this, unless they come out and talk to me about it first. Eventually, my period decided to regulate itself out shortly after and that month is the month we got pregnant. I knew literally right away that I was pregnant, and I even told my girlfriends that I didn't really need to take a pregnancy test because I was that sure. That first week I was making trips to the bathroom what felt like every hour, I started getting car sick, and my sleeping was off (these things only lasted those first couple days). Due to the happenings in the months prior, I was both so excited and shocked. The first few days I'm pretty sure I was in shock the entire time, wasn't thinking clearly, and started imagining my life as a Mommy! Billy had an idea that I was pregnant because I mentioned to him that I thought I might be, but I still wanted to surprise him and tell him in a really special way. I researched ideas on Pinterest and found the one I wanted to do. 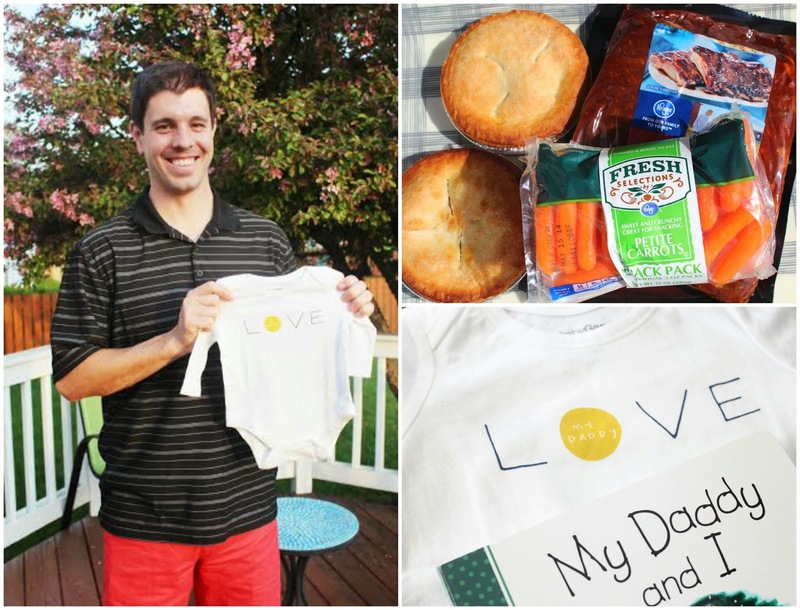 One night after work, I made him a "baby themed dinner" with baby back ribs, baby carrots, and baby cherry pies for dessert, thinking he would totally catch on to that. Turns out, he was so excited to be having baby back ribs on our new grill that he didn't, but luckily I had plan B. ha. I put together a gift box full of "Daddy" gifts to give to him after dessert...a coffee mug (from Hallmark), onesie (Gap), a book, and of course my positive pregnancy test sitting right on top! He obviously knew right away at that point and we spent the whole night celebrating, talking about what we thought our baby would look like, and laughing about the fact that he didn't catch on to the baby themed dinner. There was never a question in my mind as to who we would tell first, I have always known I wanted my Mom to be the first to know. So, we told them to come over for a cookout and when they showed up, I had a little sign out front telling them to come around the side of the house to the backyard. When they came around the corner, where our big main tree is next to our deck we had a custom onesie (from here) hanging in the tree right in sight. It was priceless! My Dad immediately goes "OHH!! ", my step mom started laughing and smiling, and of course we talked all about it over dinner. Since Billy's parents live in Cleveland, we knew the next time we would be with them was Memorial Day weekend at the lake and it was perfect timing to tell them because pretty much the whole family was going to be there for the holiday, including Billy's grandma who doesn't get up there much anymore! However, everyone was showing up at different times so we ended up telling many of them at separate times. Billy's brother was first, and we knew we wanted to tell him with Rocky wearing a big brother shirt (from here!) When we showed up to the cottage, Rocky ran in with it on and he noticed right away! It was hilarious. Billy's parents came up later (his sister was supposed to be with them, but couldn't come until later on so I actually don't have any pictures of telling her unfortunately) and we literally couldn't wait a minute to tell them...it was like we had to do it right away! After the whole family got to the cottage and found out the news, Billy's sweet Grandma gave us an adorable toast and it was so nice to be able to have much of his family there that weekend to celebrate with us! Oh my goodness, this was so fun. Here's a quick video I put together of some of our friends and families reactions! ....again, you deserve a medal if you made it this far. EEEK!! So stinking happy for you! Katie!!! I am so truly excited for you! You and Billy (and Rocky) will have the most perfect family together! You have been one of my favorite bloggers from the beginning of my blogging time and it's really cool to watch you grow. Happy for you! Praying for this step in you life! Reading about the part where you told your mom was hard so I can't even imagine how hard it was for you! You guys were sooo creative in telling everyone and your friends reaction with the wine bottle was priceless!! I absolutely love all these neat ideas on how to tell friends and family! I loved it so much...made me a little teary eyed. Still SO excited for you! So exciting! Love all the fun and creative ways you told everyone!! Congratulations! Everything about this post had me in TEARS! I loved the video and I loved how you told your mom. You guys are the sweetest! so cute! love the baby themed dinner. being more sensitive to asking others when they're having kids is absolutely the most important thing i learned while we were trying to get pregnant. Oh that video is perfect! What a fun thing to cherish forever, and show Baby K when he/she is older! And seriously, Billy? Amazing. To make a speech to your mom and know how much it means to you that she knows first, he is such a fantastic hubby! Love that you told your mama first, so sweet! That video is such a great way to look back and remember ow excited everyone is for you guys!! Congrats again! Also I have to say I agree 110% about asking people when they are having kids, it can be really hard to hear that for some couples! LOVED the video!! Seriously had tears - the tears hang around after pregnancy! HA! OMG I am a hot mess over here crying, especially at the part visiting your mom. #pregnancyhormones Love this so much. Oh my goodness, eek, so fun! Aww I love all of this!! & I started crying when it came to telling your mom!! How sweet & special though!! I teared up to the part with your mom. I know she's smiling right along with you and watching you every step of the way! Thanks for sharing your ideas. I'm really hoping I'll get to use some of these come later this fall! And that video!!! I love how you surprised everyone, so freakin cute!!!!! Love love LOVE reading this! I was so similar that my system was so messed up when we started "trying." The first month I actually ovulated (finally after waiting 10 months! ), we got pregnant! It was frustrating while waiting for my body to finally regulate itself. 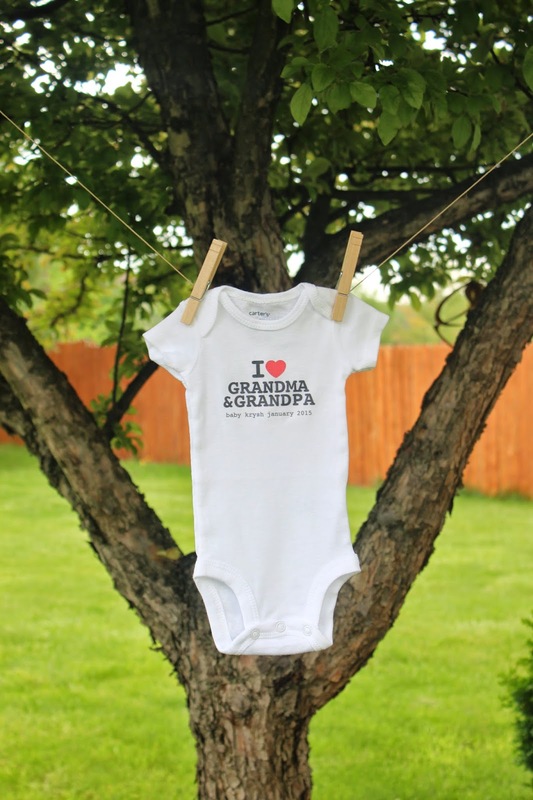 I hear you girl...my kids are the only grandchildren that won't get to meet their grandpa (my dad). It was very hard for me to come to terms with. Then I realized that my dad was the first person to ever meet our little Charlotte :) And of course, we had to name her in honor of him (*Charlie). And because of this, I'm reminded of him every single day when I'm around her. This is seriously so perfect in so many ways!! You did an amazing job with your announcements! I also totally agree with you too with the "you never know if people have been trying" part, I too never ask 'so when are you having a baby,' you just never know. Can't wait to read more updates!! You are too cute! I could not be happier for you and your husband!! I love the way you told people, so sweet. Oh my gosh the video! I started crying! Your friends are so cute and your BIL... 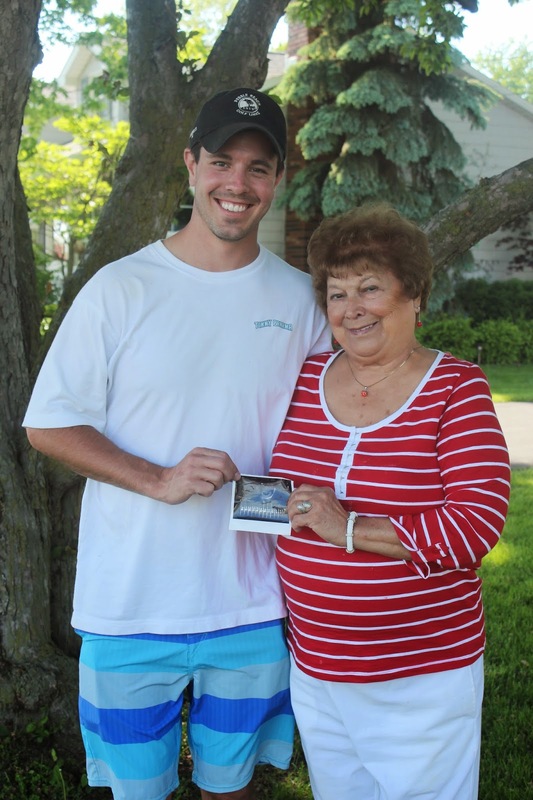 I'm gonna be an uncle ! I am so glad we filmed telling my family too... like you, I wish I could surprise people with pregnancies every day! Now I just wish I would have told Jon in a cooler way, I peed on a stick and ran into the other room crying and shoved it in his face lol. I love that you told your mommy first!! She is so proud! This video is absolutely priceless! Something to cherish forever :) Such cute ways to tell everyone! totally cried my way through this entire post (happy tears, of course)…i'm so happy for you guys! I love how you told everyone! The video was awesome! Such a great idea! Congrats to you both!! What an amazing thing to capture it all on video too. You will cherish this forever! So cute. I love the video! So sweet and now I'm crying….love the video and can't wait to follow along on this journey! oh my gosh, I was cracking up reading this! where Billy didn't catch on with the ribs because he was excited for the ribs and his thoughts on the way to telling your dad. Hilarious! plus, I'm 22 weeks pregnant and love hearing these stories. the month I got pregnant I swore I was having my normal really bad pms so I was telling the hubs it didn't work that month...then just one day late I took a test and it was positive. really caught him off guard that's for sure! Okay, i'm laughing AND crying! Sweetest thing ever! I probably cried through this whole post! I love that you told your mom first. When your girlfriend started screaming and jumping up and down with that wine bottle I teared up thinking about how happy I will be when some of my girlfriends get preggers. Congrats again lady! Watching that video and seeing the excitement of your friends & family made me tear up! CONGRATULATIONS! Totally had tears rolling down my face! So excited for you! I just love how you told everyone! And I love that you got to do it in so many ways and so many times (super jealous)! I made my baby daddy a huge banner and hung it up when he was out golfing one day! I'm going to love all the baby posts. I'm due with my first in about 2 weeks! And I'm all about everything baby! I loved reading this Katie and the part about your mom absolutely put me to tears, I mean sobbing tears! This was soo sweet everything you did and how you included all your family and friends in the announcement!! Congrats again!! I love all of this and am so happy for you guys! What a great idea to have all of that on video too, love it!!! This is seriously my favorite part of reading about blogger's pregnancy journeys! The video just had me smiling ear to ear the whole time! Congrats again! your story is so cute!! i love all your reveal ideas...especially the girlfriends!! I am starting to try and i also think it will take a while...a little nervous because i'm a little bit of a control freak and it scares me to not know whether or not there are problems...does that makes sense? anyways congrats!! Congratulations!! Such an exciting part of life. 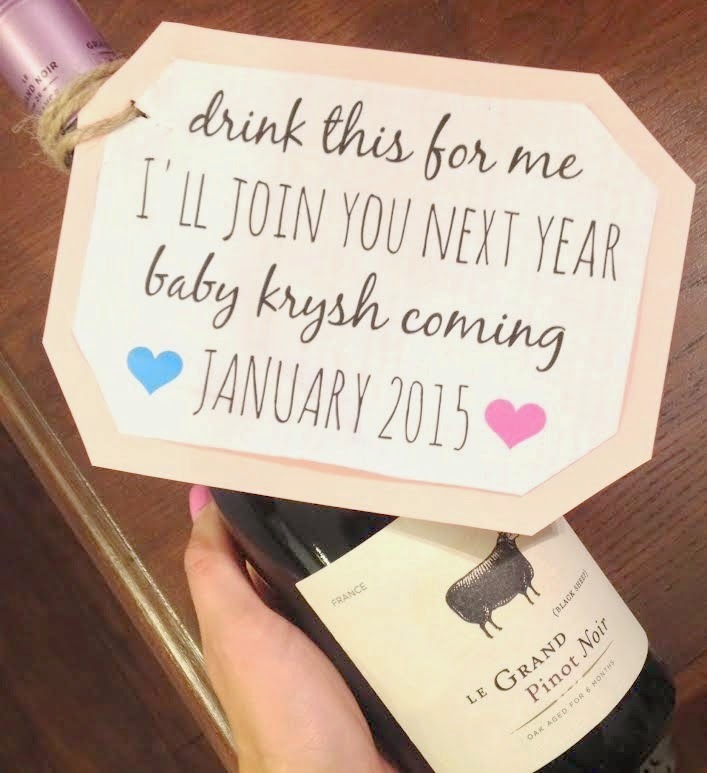 This is such a sweet story, love the way to announced it your family. Thanks for sharing. So sweet!!! I love that you have the reactions on video! And your note about your Mom moved me to tears!! There is no doubt she is so proud of you and will shine her light on that precious baby and you! 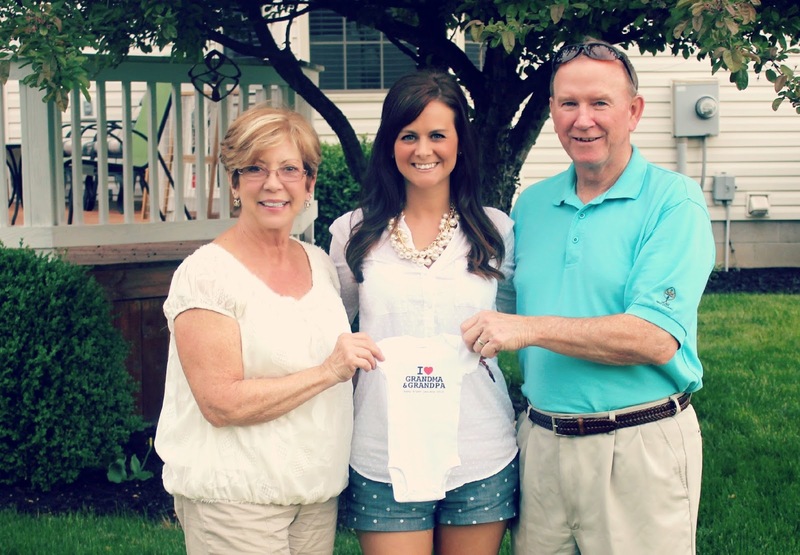 Baby Krysh will be blessed with the most special Guardian Angel!!! Congratulations, Mommy!!! This whole post was amazing! I love the video and the part about your mom made me bawl. I also lost my mom and am having a hard time dealing with the fact she won't be here for my wedding. Your husband is incredibly sweet and I wish you a wonderful pregnancy journey! Congrats again! I love the video!!! So fun I can't wait to do this one day. Congratulations! This post was so fun to read. The video was adorable. I loved your friends reaction when she started screaming. That was priceless.